We have currently reviewed 15 JBL headphones. They're a well-known brand that makes feature-packed headphones and implements new and exciting technologies in their designs. Above-average Sound Quality. We have yet to test the full lineup of headphones from JBL but the few that we have tested so far do better than average for sound quality. Being a subsidiary branch of Harman, they typically follow the Harman curve which results in a balanced bass and midrange that makes them sound good for both fans of bass and more critical listeners. Feature-packed. JBL has a wide selection of wireless and noise canceling headphones. Some of them even come with a feature-rich app that lets you control the level of noise cancellation in each ear cup as well as giving you access to auto-off timers, and a fully parametric equalizer. They even have self-calibrating headphones that give you the best listening experience based on your ears, position, and shape. Overall, JBL sets a benchmark for other brands in terms of feature-packed devices. Good for Noise Cancelling. JBL has good commuting headphones thanks to their strong noise cancellation. Granted they're not as good as some of the Bose headphones, but they do well at canceling and reducing ambient noise in most conditions. Mediocre Comfort. We've only tested a few headphones from JBL, but comfort has been one of their middling attributes.They are either too tight or have slightly small ear cups that do not quite fit well around all listener's ears. Plasticky Designs. Most of the headphones that we've reviewed from JBL have been decently well made but have a slightly plasticky feel to them, especially considering their price range. This does not mean they have a poor build quality, just that they feel a bit cheap at times. Lacks Open-back Models. 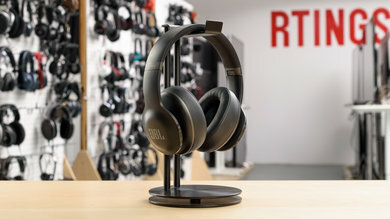 While JBL does offer a wide range of headphones for different use cases, they lack more critical listening oriented headphones with open-back designs that create spacious soundstages. This may not be an issue for most casual listeners, but this makes most of their lineup not targeted towards a pure critical listening experience. Overall, JBL makes feature-packed headphones that often follow the Harman curve. They also offer some of the more technologically advanced headphones with self-calibrating features and a robust app that gives you granular control over the frequency response and even the level of noise cancellation in each ear cup. However, they don't always have the most comfortable designs, and for their price, their plasticky build quality looks a bit cheap at times. JBL has a couple of different names for their lineups, but most of their popular headphones fall under these names. E = This is the main lineup for JBL, and it includes a lot of headphone types with varying features, from simple and straightforward in ears to wireless over-ears and on-ears. Everest = This is the more feature-packed lineup with wireless and noise canceling models including some special features like self-calibration. Synchros = An audio-oriented lineup of wired on and over-ears that do not have as many features. Reflect = An in-ear focused lineup with wireless and wired designs. The best JBL headphones that we've reviewed so far are the Everest Elite 700. They have a balanced audio reproduction and a good noise-canceling performance. They're also decently well built, durable and have an easy-to-use control scheme. They're not be the most comfortable and can be somewhat tight on some listeners, but their versatile set of features, great app and good wireless design with a long-lasting battery makes them an easy recommendation for anyone looking a feature-packed over-ears for everyday use. 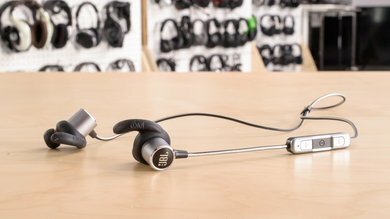 The Reflect Mini 2 are the best option for sports from JBL. They have a wireless in-ear design with decent water and sweat resistance, a stable fit for sports and an above average battery life and range for most physical activities. They may not have the best build quality and they are not truly wireless like the JBL Free which some may prefer but they have a much more reliable wireless connection overall. JBL offers a wide variety of headphones for different use cases. Their newer models also sound pretty good since they typically follow the Harman curve. That and the wide set of features like noise cancellation, wireless, and self-calibration for an optimal listening experience make them one of the best brands for all-purpose headphones. However, we have yet to measure a headset from JBL with a comfort level to match some of the other popular brands on the market, like Bose and Sennheiser. Unfortunately, they also don't make the best headphones for more critical listeners since they have no open-back models. See our recommendations for the best over-ear headphones.